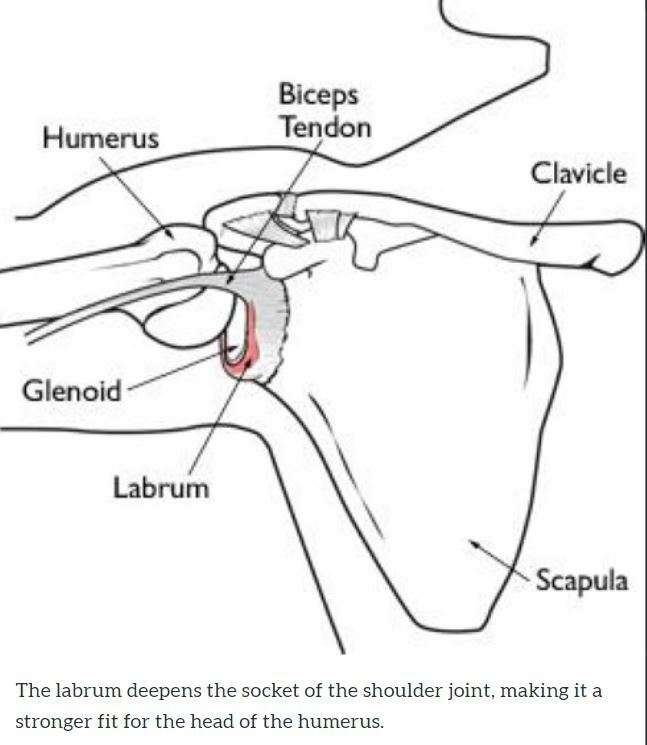 A SLAP lesion is an injury in the shoulder that is characterized by a tear of the labrum and long head of the biceps tendon insertion (see image below). SLAP stands for Superior Labrum from Anterior to Posterior, which signifies the location of the labrum injury at the top of the shoulder joint and the direction of the tear running from front to back that is typical for this type of injury. What are the signs of a SLAP lesion? Pain is the most common symptom and is often a vague discomfort deep within the shoulder that is aggravated with overhead activity, throwing, lifting, or holding the arm out in front of the body. Occasionally, with larger tears, mechanical symptoms of popping or clicking with shoulder motion are noted. What causes a SLAP lesion? A SLAP lesion typically occurs in overhead athletes such as baseball pitchers, volleyball and tennis players, but can happen with work related injuries, falls or overuse conditions as well. A sudden forceful exertion of the shoulder can cause the biceps tendon to detach the labrum from where it attaches to the shoulder, or repetitive small injuries can lead to an overuse type of injury with gradual onset of pain over time. 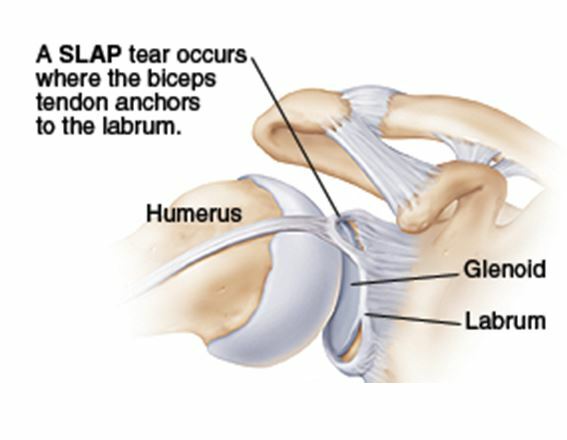 Depending on the severity of the injury the SLAP lesion can either be a partial injury with fraying of the labral attachment, or a complete tear with a displaced labrum as in the image below. An MRI is often required to diagnose and determine the severity of the SLAP lesion. Many SLAP lesions respond favorably to nonsurgical treatment with anti-inflammatory medication, corticosteroid injection and a therapy program and is typically the first line of treatment. Occasionally, surgery is required to address the SLAP lesion in cases that fail to respond to nonsurgical treatment, especially for more severe complete tears. The particular surgical procedure depends on the type of tear and the age/activity level of the patient. Some SLAP injuries are amenable to arthroscopic repair by reattaching the labrum to the glenoid with suture anchors. Newer research is suggesting however, that in certain situations a biceps tenodesis procedure can have superior results. Biceps tenodesis involves detaching the biceps tendon from the labrum and reinserting the biceps further down on the humerus outside of the shoulder joint. Regardless of the type of surgery performed, a period of shoulder immobilization with a sling is required followed by a rehabilitation program with gradual return to work/sport. If you have signs or symptoms of a SLAP lesion feel free to call our office to schedule an appointment with one of our fellowship trained Orthopaedic hand and upper extremity surgeons that specialize in both the non-surgical and surgical treatments of shoulder pathology.